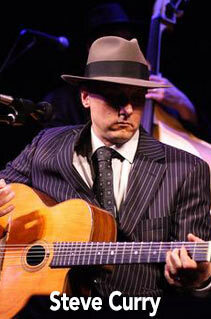 Steve Curry plays almost 200 shows a year with the award winning Gypsy Jazz meets Western Swing band-” The Texas Gypsies”! www.texasgypsies.com… He started touring full time on the road at the age of 19 and a year later he ended up in Los Angeles and studied various guitar styles at the Musicians Institute. While living in LA, he toured or recorded with such diverse artists as The Jacksons, Boney James, Jeff Buckley. He also has played on many TV and Film tracks and has produced and or played on over 50 CD’s for local and national artists!